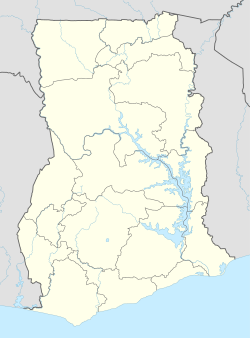 Achimota is a town in the Accra Metropolitan district, a district of the Greater Accra Region of Ghana. Achimota is known for the prestigious Achimota School from which it got its name. Achimota is also known for the St. John's Grammar Secondary School, . Achimota is located on the Accra highway just after Tesano and has well laid buildings, bars and a good nightlife. The Achimota Hospital is the primary healthcare institution in Achimota. Achimota is served by a station on the Ghana Railways. ^ "Educational Institutions". www.centralregion.gov.gh. Retrieved 12 August 2011. ^ "References » Schools/Colleges". www.modernghana.com. Retrieved 12 August 2011. ^ "List of Secondary Schools in Ghana". www.ghanaschoolsnet.com/. Retrieved 12 August 2011.